If chic design, yacht-like curves and the feel of a smart boutique hotel appeal, the all-new Celebrity Solstice could be the ship for you. 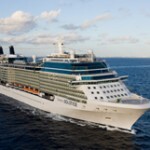 Welcome aboard Celebrity Cruises’ latest vessel. With a lawn the size of eight tennis courts, an AquaSpa combining the latest technology and treatments, and sophisticated dining options, Celebrity Solstice redefines luxury cruising. 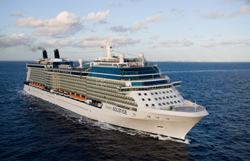 Celebrity Solstice is a Solstice-class cruise ship owned and operated by Celebrity Cruises. She is the largest cruise ship built in Germany. With so many places on board to eat, drink, sunbathe and admire the scenery, most passengers will barely notice the presence of 2,850 other guests. 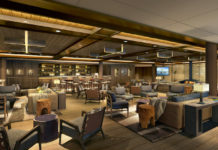 Solstice, the newest vessel in the Celebrity Cruises’ fleet, is both dramatic and decadent. Its stunning atrium lobby, 13 decks high, is softened by silver, gauzy curtains, while the dining room, Epernay, is flooded with light from floor-to-ceiling windows. A huge, glittering chandelier illuminates a glass staircase and there’s an amazing ‘wine tower’ that will store 1,800 bottles of red. The huge spa has an ancient Greece theme, and in the nightclub swinging chairs are suspended from the ceiling. Musical water fountains by the pool play to anything from opera to chill-out music, while in the theatre, circus performers fly above the audience. If you thought cruising was stuffy, this is surely the ship that will change your mind. Celebrity Solstice is the world’s first cruise ship with a lawn. The size of eight tennis courts, the Lawn Club on the top deck has real growing grass on which guests will be able to try boules, croquet, putting or simply relax with a picnic. Another first is the dramatic Hot Glass Show, developed in collaboration with the New York Corning Museum of Glass. 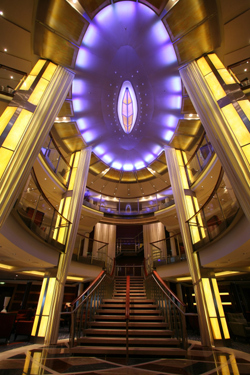 This will take place in a specially-built glassblowing studio where three resident glass-blowing artists will entertain cruisers with live glass-making shows, lectures and workshops. Smart and contemporary, with neutral, coffee-and-cream tones, comfortable beds, flat-screen TVs and deep balconies. Bathrooms have big, glass-enclosed power showers and light-reflecting mosaics, as well as fog-free mirrors. 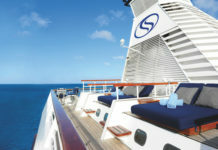 Some 85 percent of cabins have a private balcony and we’d recommend paying for one of these –a balcony with its own sun lounger is a huge asset in the Caribbean or the Mediterranean, where this ship cruises. 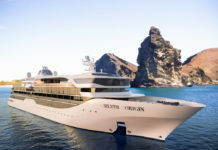 Spa junkies could try the more expensive AquaClass staterooms, with aromatherapy scents, pillow menus, and unlimited access to the Persian Garden, an area of aromatherapy steam rooms and saunas. Healthy and incredibly varied, with some contemporary twists. Gone is the binge-inducing midnight buffet– the dietary downfall of many a cruiser – to be replaced by weekly brunch. In comes ethnic cuisine –Asian, Italian, Mediterranean and Middle Eastern – and out go the rich, stodgier, traditional staples. Smoothies, wraps and stir-fries are on the lunch menu, while for the late-night munchies, there will be an after-theatre menu serving tartlets, hot brochettes, canapés, cheeses, fresh fruit and petit fours. Restaurants other than Epernay include Tuscan Grille, a butch-but-stylish steakhouse, and Silk Harvest, offering Asian fusion dishes, right down to Asian-influenced martinis and cocktails created with ginger root and acai berries. Romantic Murano serves extravagant French dishes with tableside preparation. There’s a Bistro with outside seating, a lavish buffet in Ocean View and a Californian-Mediterranean restaurant, Blu, for AquaClass guests. We love the Martini Bar & Crush, which has a frosted bar serving 100 varieties of vodkas from around the world and a small alcove with a n ice-filled table where guests can participate in caviar and vodka tastings, or even throw a private party. After dinner, dramatic circus shows in the main theatre will reflect the current cruise trend of Cirque du Soleil spin-offs, while other choices include Michael’s, a clubby piano bar; a jazz lounge; and Quasar, a futuristic but retro nightclub. Labadee (Haiti). 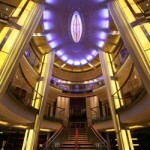 In summer 2009, the ship will be based in the Mediterranean. The nine-night Caribbean fly/cruise costs from £1,228 per person including flights, transfers and a seven-night voyage.